Established in the year 2002, Sagar Biotech Private Limited is counted amongst the most promising Manufacturer, Exporter and Trader firm of outstanding quality Hybrid Seed. We have attained an unsurpassed growth by presenting a wide gamut of high-quality seeds, including Hybrid Watermelon Seeds, Hybrid Muskmelon Seeds, Hybrid Chilli Seeds and much more. Our offered seeds earned us nationwide recognizance for its strong resistant to fusarium wilt and anthracnose, tolerant to drought and wet, excellent keeping capacity for long transportation, easy fruit setting, vigorous plant growth with high resistance tolerance power and equitable price range. We spare no effort to align our business operations with the evolving demands of the agriculture industry. Further, the core principles of sustainability and liability equip us to bring forth a quality tested a range of organic seeds. We aspire to discover hybrid quality seeds that boost the productivity levels of farming entities. This is why we leverage prevailing technology at our modernized R&D set up and hi-tech quality control laboratories. With an assurance of improved crop yield, is we believe our proficiency to deliver products within the agreed time frame gained us confidence to become the most consistent entity of hybrid seeds. 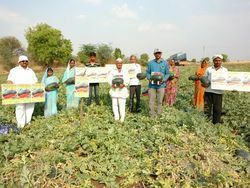 Our leader and mentor Mr. Chintan Patel backed with deepest insights of the farming trends in the country. His rich knowledge and expertise guide us to deal with superior quality seeds to make a positive contribution to the society. Being a client centric organization, our main motive is to fulfill the diverse requirement of the clients. Our fruit, vegetable and flower seeds are offered to the clients at cost effective prices. We offer f1 hybrid seeds, which are widely appreciated in the market Owing to our superior quality seeds we successfully catered to the requirements of our myriad clients across the Indian Sub Continent. We also provide requisite information about the types of pesticides to be used during the cultivation process. Our clients can get valuable information about the conditions to be taken care of during the entire crop cycle. At our premises, we have established a well-equipped infrastructure facility. Owing to this, we have been able to deliver the offered products in large quantity. Also, we have parted infrastructure into various departments. Each department is handled by the experienced workforce. In addition to this, we regularly upgrade our infrastructure to keep our production process in line with the modern trends. We are a renowned name in this domain engaged in offering high-quality Hybrid Watermelon Seeds, Hybrid Muskmelon Seeds, Hybrid Chilli Seeds and much more. Owing to the superior quality of our seeds, we have earned the trust and faith of the clients. We have a well-developed vendor base from which we procure our range of Hybrid Watermelon Seeds, Hybrid Muskmelon Seeds, Hybrid Chilli Seeds and much more. Our vendors are selected after a through market research. We select our vendors on the basis of their market reputation and quality of products. We maintain close coordination with our vendors, so that products can be offered as per clients requirement. We Sagar Biotech Private Limited started in the year 2002, are one of the foremost Manufacturers, Exporter and Trader an extensive array of Hybrid Watermelon Seeds, Hybrid Muskmelon Seeds, Hybrid Chilli Seeds and much more. Designed by the use of excellent quality material, these are available in several sizes as per the exact requirements of our customers. Our product range is appreciated by our customers owing to their lightweight, perfect finish, appealing design, and long-term durability.